"Kirk, Kirk, Howell, Cutler & Thomas has been my attorney team for over 13 years, they have helped manage both domestic issues as well as business issues from the time I was a company of just me until the company of several hundred. I have found their integrity to be unwavering and the amount of protection and forethought they offer a client is second to known. Terrell my primary attorney has always been ready to assist me any endeavor whether it be a quick call for bouncing ideas or a preparing for a legal matters for my team, my family and myself. I can honestly say I could not recommend a better firm for all our legal protective matters." "The thing that impressed me most about KKHCT is the fact that they cared. There was a definite sense of caring, not just that I was a client, but someone that you genuinely cared about and wanted to help. The fact that you took the time to even explain things to my wife. The lawyers and staff all made everyone very relaxed and at ease, and confident in all of your representation. We walked away resting assured that things were going to get handled as they should be." "My legal matter involved a fight with a well-financed and powerful national company. I knew that I needed to hire a law firm that was not afraid to go toe to toe with that company and fight for my rights. Not only did the firm successfully handle my case, they kept me informed every step of the way and made me feel like my case was important to them. It was a real comfort knowing they were in my corner. I wholeheartedly recommend Kirk, Kirk, Howell, Cutler & Thomas!" "I cannot say enough about the great job Kirk, Kirk, Howell, Cutler & Thomas did for my family when a municipality decided to cut off road access to our family’s land in Nash County. We knew they were experienced in fighting for the rights of landowners but were even more impressed with the passion they showed in defending our family. They really went the extra mile to make sure we were treated fairly. If the government decides it wants your land, these are the lawyers to call." "I was notified by the Department of Transportation that my business and commercial property were being acquired by eminent domain for a highway project. I realized that I was not going to be able to get what I thought was fair compensation without help. I hired Kirk Kirk and immediately realized that they were extremely experienced in dealing with this area of law. The results exceeded my expectations. I would highly recommend them to anyone dealing with eminent domain issues." "I would recommend Kirk Kirk to anyone. They represented me and my family when we were in a serious accident. The concern and care they offered, immediately made us feel at ease. They were always easy to reach when we had questions and keep us informed. I was extremely satisfied with the settlement I received." "Kirk Kirk Howell Cutler & Thomas took my personal injury case after the insurance company denied liability. I realized after they filed suit and were litigating the case, that they were truly committed to getting me a good result. The end result was a very good jury verdict." "I observed a friend at work who was going through a very sudden, difficult and scary divorce with an emergency child custody issue. I was so amazed by the outcome that I asked him who the attorney was who championed for him. Six years later when I found myself in a similar situation, I knew exactly who to call. I called Mr. Thomas and he quickly realized the urgency of the matter and he worked tirelessly on my behalf. Because of Mr. Thomas’s commitment to my case, my children were quickly protected and we had the best possible resolution to an extremely difficult situation. I hope that you never find yourself in a position to need this type of representation, but if you do, you can’t find a better advocate than Mr. Terrell Thomas and his law firm." "I think the firm, meaning Mr. Cutler and Ms. Booker, were both very personal and professional and had my best interest at heart. They always shot straight with me. A family type atmosphere if you will. That is how I felt." "As a mother, when I came to KKHCT with legal concerns I was highly impressed with the expertise, genuine concern, and personal interest that I received from everyone at the firm. There was never a time that I felt like my family was judged, reprimanded, or looked down upon because of our family needing services. KKHCT was so helpful and accommodating to us legally, financially, and personally." "From my first phone call to my consultation, Ms. Booker was so sincere and very understanding of my situation. She made us feel like regular people. She was outstanding in explaining things to us and I left feeling very relieved. I am so thankful for her help." "KKHCT is a great law firm. Everyone made me feel like my case was number one and it showed because Jeff won my case. I always was well informed and advised concerning my case and I would not hesitate to use their firm again for any legal matter." 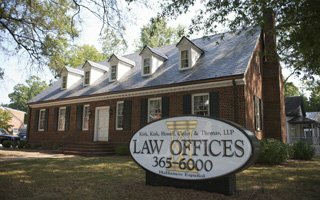 "When the NC DOT decided to take my land in Onslow County, I knew I needed the help of a law firm with experience in eminent domain cases that was not afraid to take a case to jury verdict anywhere in the State of North Carolina. Kirk, Kirk, Howell, Cutler & Thomas was that firm. Their skill in putting together and presenting my case was impressive. I highly recommend them." "When my mother died, I was faced with a variety of decisions, not the least of which was handling the legal responsibilities of her estate. Terrell Thomas was recommended to us by my mother’s lawyer. Having Terrell handle these legal aspects has been the best experience that I could imagine at such a time. He has anticipated every legal request from the courts and has managed everything very well, always giving us a heads-up when we need to take certain actions. And there has always been a presence of thoughtful compassion in our interactions. I would recommend Terrell to anyone needing help with the administration of an estate or their estate planning needs. He provides great service and has made this process go very smoothly."